mahris-0 has no other items for sale. I haven't actually fired any shots with my crossbow or muzzle loader with my iphone mounted in it but it seems to be a good solid mount to the scope. I was pleasantly surprised that most of the mount is made of metal. One thing to be aware of though is the rubber pieces that hold the phone in the clamps just slip on to the brackets and will work their way off if not paid close attention to. I lost one but fortunately found it at the bottom of my tree that my tree stand is in. Originally wanted a mount that would line up my phone with the scope on my rifle but this mount keeps the phone too close to the scope leaving a poor field of view and also obstructs the bolt action on my rifle. Not confident that it wouldn’t blow my ability at a big buck. So instead I was able to position the mount so the phone camera is just above the scope and I’m still allowed to line up my eye with the scope and just enough clearance to load the bolt action. 3 stars because not what I intended but i can still use it for so live videos while hunting. This is a false advertisement. 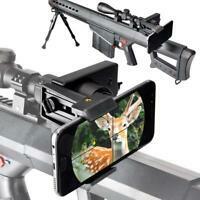 DO NOT BUY if you are mounting this on a rifle scope. There is no eye relief to get any focus. I bought this for my airgun rifle scope believing the title that it will work. NOPE! It does not work. For microscope, spotting scope, telescope where it does not need the eye relief, it will work fine. I was simply amazed at how well it works! Used adapter on cellphone to give great picture of moon! Focus always perfect.Clouds were thin and moving.